With few exceptions, my postgraduate offers follow a pattern. On the second semester, I offer my “101” Multimedia Information Retrieval course, which introduces multimedia representations, machine learning, computer vision, and… information retrieval. On the first semester, I offer a topics course, usually following a book : so far we have explored Bishop’s PRML, Hofstadter’s GEB, and Jaynes’ “Probability Theory”. “Artificial Intelligence is trending again, and much of the buzz is due to Deep Neural Networks. For long considered untrainable, Deep Networks were boosted by a leap in computing power, and in data availability. Deep Networks stunned the world by classifying images into thousands of categories with accuracy, by writing fake wikipedia articles with panache, and by playing difficult videogames with competence. My aim here is a less “neural” path to deep models. Let us take the biological metaphors with a healthy dose of cynicism and seek explanations instead in statistics, in information theory, in probability theory. Remember linear regression ? Deep models are multi-layered generalized linear models whose parameters are learned by maximum likelihood. Let us start from there and then explore the most promising avenues leading to the current state of the art. This course will be nothing like your typical classroom experience. There will be no lectures. We will meet once a week for a presencial session to discuss previous work, and plan our attack for the next week. I’ll expect you to continue working throughout the week. There will be no exams. I’ll grade your work based on participation during the sessions, progress between sessions, self assessment, and peer assessment. Active participation will be mandatory. This means (surprise !) talking in public. Everyone will be learning together, so all of us must accept the risk to be wrong. This course won’t work for those who always want to appear wise and knowledgeable. The course will be in English. Deep networks can be seen as hierarchical generalized linear models. We’ll be a cozy small group : at most 12 students. I’ll select the candidates based on a letter of intentions, and on previous experience. Write a short e-mail to dovalle@dca.fee.unicamp.br. No need to be fancy : just state your reasons for participating, and any previous experience (academic, professional, and extra-curricular) with Machine Learning, Statistics, Probability, or Information Theory. Very important ! If you want to enroll at this course without being enrolled at the program (what UNICAMP awfully calls “special students”), you have to do you pre-enrollment until 7/Dec/2015 (hard deadline !). Even if you are enrolled at the program (“regular student”) send me your application at most until 31/Dec/2015, because I’ll select regular and special (urgh !) students at the same time. EDIT 20/01 : I have sent the acceptance notices — looking forward to work with a swell group of very motivated students ! 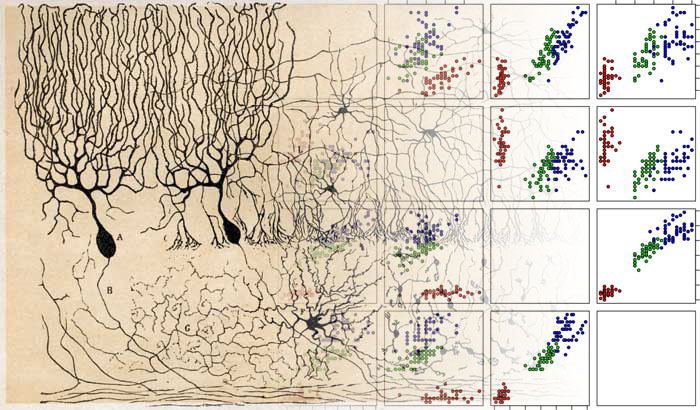 Image credit : composite from Ramón y Cajal 1st publication showing a cerebellum cut, and scatterplots from Fisher’s iris dataset drawn by Indon~commonswiki, wikimediacommons. Information retrieval and content-based image classification are progressing fast. A key application for those technologies is Computer-Aided Diagnosis (CAD), improving doctors’ ability to detect diseases and prevent their progression. Our aim is to advance the state of the art in disease screening based upon images, focusing on the early screening of melanoma. The techniques covered in this project are Deep Learning Architectures and Bag of Visual Words models, which show complementary advantages. The grant provides us with Azure’s resources (storage, processing units, etc.) to run our techniques in that cloud-based environment. We are much thankful to Microsoft Research for this opportunity.